This month, SYNTHESIS speaks with Dr. Nisha Sajnani, RDT-BCT, an associate professor and coordinator of the Drama Therapy program at Lesley University in Cambridge, MA. She is the co-editor (with David R. Johnson) of Trauma-Informed Drama Therapy: Transforming Clinics, Classrooms, and Communities. In addition to serving on CANY’s Advisory Council, Dr. Sajnani is editor of the peer-reviewed journal Drama Therapy Review and has served as president of the North American Drama Therapy Association. Greetings, Nisha! In addition to the success of your book with David Read Johnson, you recently presented a compelling lecture on trauma-informed drama therapy, ‘Performing Love and Loss in the Aftermath of Collective Violence’ kicking off CANY’s 2014/2015 seminar series. How did you find yourself drawn to this area of drama therapy practice and education? I have been interested in how drama-in-education and drama therapy contribute to social development for some time. As an undergraduate studying education, theatre, and psychology in Edmonton, Alberta (Canada), I took a course in applied theater with Carolyn Howarth, founder and co-artistic director of Concrete Theatre. Each class introduced me to theatrical metaphors for critical social issues like homelessness, sexism, and poverty. I also studied drama in education with Joe Norris and joined his educational theater company, Mirror Theatre. We developed plays on bullying, racism, and peer leadership. It was through Mirror Theatre that I met Michelle Buckle who introduced me to drama therapy. Following graduate work in drama therapy and community economic development at Concordia in Montreal, I inherited and co-directed (with Amy Thomas) a non-profit organization called Le Centre Artisanal des Femmes (Women’s Art Center) from Millie Ryerson, an occupational therapist who understood the importance of engaging those who were most vulnerable to social exclusion in a direct experience of sustainable arts practices. The center was a hub to a diverse group of students, artists, and teachers of varying ethnicities, abilities, and class backgrounds. Social spaces like these are special and rare. In fact, as we argue in the book, schools may be one of the only spaces we have left where we can experience a convergence of children, families, public servants, municipal leaders, and other community members. What can you tell our readers about the growing trends that you observe within the theory and practice of trauma-informed drama therapy? In our survey of emerging approaches, we discovered that drama therapists are, not surprisingly, negotiating current cultural tensions that privilege the individual over the collective, cognition over emotion, distance over proximal contact, and the brain over the rest of the body. There is tremendous pressure to redefine what we do in the language of dominant paradigms: instead of building creativity and spontaneity, we are engaging in resilience enhancement; instead of physicality, we are doing stress management; instead of dramatic enactment, we are employing imaginal exposure; instead of embodied, exuberant play, we are improving attachment; instead of witnessing and restorying, we are applying cognitive restructuring. How do you see the CANY model contributing to the field? Accommodating the language of empirically tested and widely circulated treatments such as CBT can help us build bridges and coordinate care but we shouldn’t forget what the specific contributions of drama therapy are. Drama therapists, like those who practice at CANY, are highly skilled practitioners who are able to manage the flexible titration of cognitive distance through the use of dramatic metaphor. What I especially appreciate about CANY’s approach is the emphasis given to encouraging the spontaneity and creativity of group members as a means of strengthening their response-ability to themselves, to each other, and to their environment. CANY group in action. Photo: Cathryn Lynne Photography. Much of your work explores collective and cultural experiences of trauma survivors. From your perspective, what are the responsibilities of CANY group leaders as well as other drama therapists working with trauma-affected populations, especially pertaining to cultural humility? Trauma is a contested term. In applying a trauma lens constructed by the global north to understand suffering, we risk pathologizing individuals and normalizing the status-quo. Our definition of traumatic stress arose from intersecting social movements that sought to counter the social shame and exclusion experienced by battered women and war veterans and to channel resources to these and other vulnerable social groups. It is important for drama therapists to work at understanding how the distress that they see in their clients continues to be a reflection of historical and current epidemics of relentless social, economic, and political violence- like a play within a play. The concept of cultural humility calls us to “maintain an interpersonal stance that is other-oriented (or open to the other) in relation to aspects of cultural identity that are most important to the [person]” (Hook, Davis, Owen, Worthington, & Utsey, 2013, p.2). For drama therapists, I take this to mean maintaining an interpersonal stance that is open to the metaphors, images and dramaturgy of those we work with. From this stance, we share authority with our clients and accommodate the ways in which they understand what hurts and what needs to change. Consider Eduardo Duran’s call to consider Indigenous approaches to rethinking trauma (Daniels & D’Andrea, 2007). He describes how intergenerational and historical legacies of harm inflict ‘soul wounds’ that disrupt the mental, physical, and spiritual life forces of individuals and communities as well as their offspring. He prescribes a treatment that combines individual care, community outreach and advocacy and healing the land. This ecological perspective, while perhaps unfamiliar to many drama therapists, is one of many that we should consider if we care about working from the worldviews of our participants. What is the role and therapeutic value of performance within trauma-informed drama therapy? Performance provides a platform from which to give voice to silenced experiences within a supportive environment, countering the shame and isolation experienced by many survivors. The process of developing a script, finding suitable metaphors, trying on roles, and rehearsing a performance provide a means to organize and communicate one’s inner experience. Casting the audience provides survivors of trauma with opportunities to make choices about who needs to hear their story. Performance in the aftermath of violence can provide a means to re-member those parts of the self that have previously been negated and to reconnect with others. If you could share with SYNTHESIS readers one or two of your ongoing questions about trauma-informed drama therapy, what would they be? 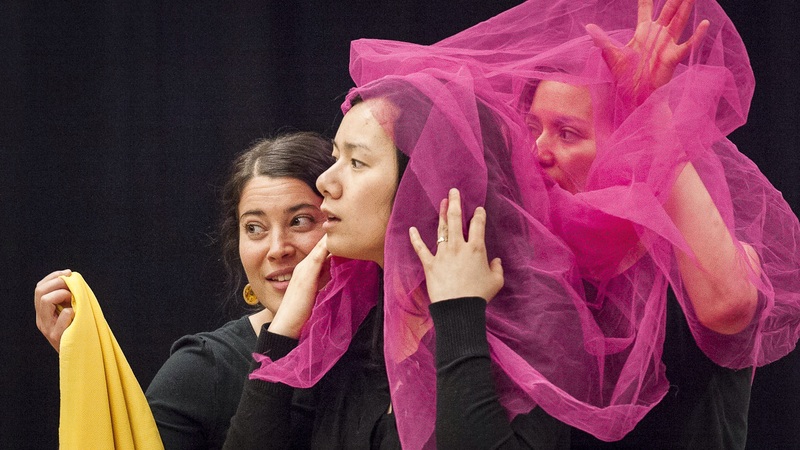 How does drama therapy address specific expressions of traumatic stress? How can we best track and evaluate the efficacy of our practice in this area? What does thinking about your drama therapy practice from the perspective of trauma allow you to see and what are the potential drawbacks to a trauma-informed approach? READY TO RESPOND?! Leave a REPLY below. Nisha and CANY would love to hear from you. Hook, J. N., Davis, D. E., Owen, J., Worthington Jr., E. L., & Utsey, S. O. (2013). ‘Should’ we meet in the middle?